SALT LAKE CITY (October 12, 2018) – The Salt Lake City Stars, the NBA G League affiliate of the Utah Jazz, will host three contests at Vivint Smart Home Arena during the 2018-19 season: the team’s home opener on Nov. 6 vs. Texas, Dec. 13 vs. Northern Arizona and Feb. 8 vs. Santa Cruz. For the third-straight season, the club’s remaining home games will be played at Bruin Arena on the campus of Salt Lake Community College in Taylorsville. The team’s promotional schedule features popular returning theme nights including Princess Night (Dec. 15), Teddy Bear Toss Night (Feb. 7), STEM Education Night (Feb. 8) and Superhero Night (March 8). The regular season will conclude with Fairy Tale Night and Fan Appreciation Night on March 22. All home games at Bruin Arena will include inflatables, pop-a-shot, face painters and balloon artists in the Kids Zone, presented by University of Utah Health, as well as appearances by the Stars Stunt Team and Buster, the team’s mascot. At the conclusion of every home game, select Stars players will participate in a postgame autograph session for fans on the court. The 2018-19 campaign marks the Stars’ third season in Salt Lake City. Head Coach Martin Schiller returns for his second year at the helm, leading a roster highlighted by two-way players Tyler Cavanaugh and Naz Mitrou-Long, who will split their time between the Jazz and Stars this season. More information about select theme nights, including a design of the bobblehead for the March 1 contest, will be released throughout the season. The Theme Night Mini-Plan for the 2018-19 season is on sale now, which includes tickets to the following six nights: Wizard Night, Princess Night, Star Wars Night, World Record Night, Superhero Night and Fairy Tale Night. The mini-plan also guarantees fans will receive that evening’s giveaway item, with tickets starting at $10 per ticket. To purchase the Theme Night Mini-Plan, call (801) 325-STAR (7827). 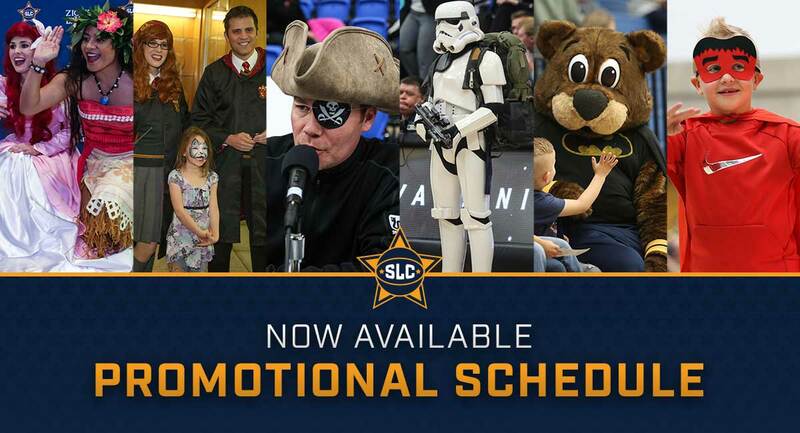 2018-19 Stars season tickets are also on sale at www.slcstars.com or by phone at (801) 325-STAR (7827). Season ticket membership benefits include the best ticket prices, exclusive events with Stars players and coaches, and more.